Today’s company is in the process of dramatically rewriting its history. For some time this ASX junior has focused on a revenue-generating wholesale business, and had also made a canny investment in a lithium play with pleasing results. Now it is expanding its portfolio with the pending addition of the blue metal of the moment: cobalt. This tightly-held cobalt-chasing company has secured an option to acquire what has the potential to be a very high-grade copper-cobalt project in Nevada’s mineral-rich Goodsprings district. Let’s just dwell a second on how tightly held this company is: three directors hold 42.85% of stock. The top 20 hold 84% of stock. With a registry like that success could have a large impact on shareholder returns and lead to a quick re-rating for this $4.4 million-capped company. If you are thinking you are paying too much for this company at current prices, think again, because the market capitalisation is only $4.4 million and the company has net assets of $8.8 million. Certainly there’s a fair bit of blue sky ahead. This means there won’t be any time wasted with this new acquisition as the company looks to make an impact for shareholders and improve its enterprise value (EV) – an enormous focus for this company. Once the acquisition is complete, the company will commence immediate exploration at what will be known as the Highline Project, meaning a stream of heavy news flow to come in the coming months. Of course this is a very early stage play and investors should seek professional financial advice if considering this stock for their portfolio. The project to be acquired is surrounded by four historical cobalt mines, and neighbours include the ASX-listed New World Cobalt (ASX:NWC) and Tyranna Resources (ASX:TYX). Both have aggressive exploration programs planned for the next six months on their respective projects. 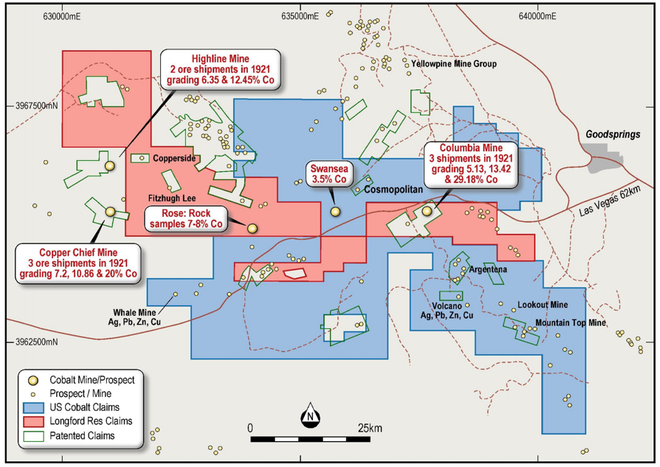 Historical small-scale mining in the claims to be acquired produced results of up to 12.45% cobalt and an average production grade of 35% copper. The nearby New World Goodsprings Copper-Cobalt Project (less than 1km away), now owned by New World Cobalt, boasts a rich history too... Almost a century ago, three parcels of cobalt ore were mined and sold, with individual ore parcels grading 29.18% cobalt, 13.42% cobalt and 5.13% cobalt. What’s more, there’s been no modern exploration at the project area, which could make for an exceptional prospect indeed. It’s no secret that in recent years, cobalt has experienced quite the surge in popularity, thanks to its use in lithium-ion batteries. Interestingly, this company has already made its foray into lithium. The company is the ninth largest shareholder of European Lithium Ltd (ASX:EUR | FRA:PF8 | VSE:ELI) with 11,000,000 ordinary shares. EUR is developing the advanced Wolfsberg Lithium Project in Austria. Clearly, the company has one eye on the new energy movement and the other eye on shareholder value. Now it’s time to bring the two together and make the most of what could be an exciting new project and direction. The Highline project boasts previous production results of up to 12.45% cobalt, along with copper at average grades of around 35% which are extremely encouraging. Consider that in Australia cobalt grades of up to 3%, can grab the market’s attention as was the case for Northern Cobalt (ASX:N27) last November which saw its share price surge 41%. Alloy Resources (ASX:AYR) also saw its shares surge in February last year after reporting sub-1% cobalt grades. Given the prospectivity of this project, could today’s company repeat those feats? It’s time to take a closer look at this micro-cap staking its claim in the Nevada metals scene. 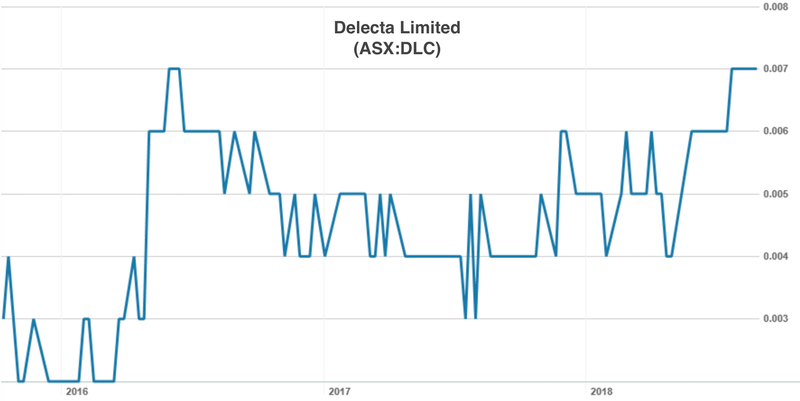 Delecta Limited (ASX:DLC) has chosen an ideal time to move into the world of cobalt-crazed battery minerals exploration. It’s aiming to capitalise on the demand for battery minerals such as cobalt, lithium and vanadium and source it from a highly ethical region such as Nevada. Here’s an explanation of why exploring for cobalt is important as we head to a ‘cobalt cliff’. Certainly, DLC is getting in at the right time in the right place. Much of the world’s cobalt is sourced from the Democratic Republic of Congo which is a high risk mining location and poses ethical problems with reports that mines rely heavily on child labour. That makes safer, ethically sourced cobalt an attractive prospect, and comes as electric vehicles continue to gain popularity and more cobalt is required to manufacture the lithium-ion batteries that powers them. Given this development, DLC could already be positioned high up on the starting grid. Then there is the price of cobalt to consider. Current demand has led to a rapid rise in the cobalt price on the LME from US$23,000/ton in March 2016 to hit a peak of US$94,500/tonne earlier this year. It is little wonder then, that DLC has entered into a binding option agreement to acquire a 100% interest in the high-grade Highline Cobalt-Copper Project located Nevada, USA. ii) The issue 50 million fully paid shares in the capital of the company (voluntarily escrowed, from the date of issue, for a period of 6 months). The acquisition is part of the small cap’s diversification strategy aimed at capitalising on the well-documented, abovementioned growing demand for battery minerals. To take a step back for moment, DLC’s background is in the retail space. It owns a wholesale business distributing adult products and lingerie which is still in operation and generating revenue. However, adopting a diversified strategy made sense for the company as it can broaden its revenue base, potentially grow its revenues quicker and possibly re-rate it from its current low market cap of just $4.4 million. Suffice to say there are high expectations for this cobalt play. With this cobalt play, there are a few outcomes DLC might have in mind at it looks to diversify the business. The first might be to sell the existing wholesale business and keep DLC as a mining play. A second option might be to spin off its metals plays and interests into a separate entity, thus leaving the Delecta name to continue its wholesale business. To make sure it is doing the right thing in terms of diversifying its business, DLC will be making full use of the 90-day option period to complete a geological review of the Highline project and surrounding area. It will conduct an initial exploration program including mapping the mineralisation at surface, rock chip sampling and geological structural interpretation. Follow up drilling will look to test the project’s economic potential. Considering the claims have been explored (albeit rudimentarily) and mined for copper and cobalt in the past, roughly 100 years ago, DLC consider it to be a fairly low risk play. Certainly a lot has changed in 100 years. Today DLC can bring modern exploration methods to an area with a minerals-rich history, with hopes of unlocking the cobalt potential at Highline. Yet it remains a speculative play in terms of its ability to unlock this potential and investors should take a cautious approach to any investment decision made with regard to this stock. We first covered EUR in our sister publication Next Mining Boom and followed them for over a year with our last coverage coming in the article EUR on Fast Track to Lithium Production in the Heart of Europe. We started our coverage back in 2016 just when the dial was being turned up. You can see from the graph above the trajectory EUR has taken since our last article in February 2017. DLC is aiming to do something similar. 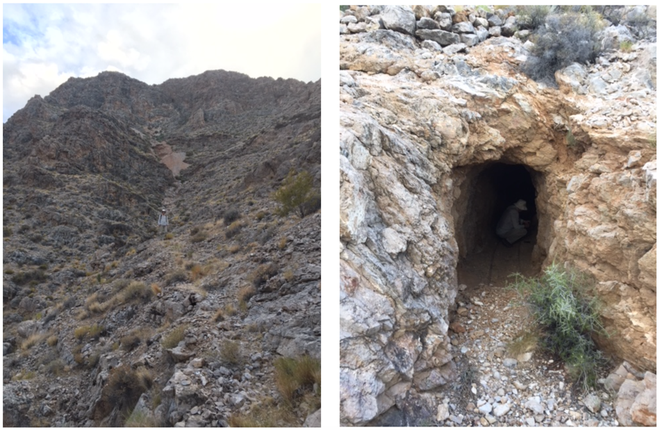 The project DLC is looking to acquire comprises five patented mining claims totalling 90.4 acres within the Goodsprings mining district in southern Nevada, 48 kilometres southwest of Las Vegas and approximately three kilometres southwest of the town of Goodsprings. The region is structurally complex with Cambrian to Jurassic dolomite and limestone having undergone folding and faulting. North to northeast oriented thrust faults dominate the structure, generally paralleling the strike of the beds. The mineralisation occurs as either flattish tabular bodies that are bedding parallel or cross at low angles where the bedding is dipping or follows steep dipping fault zones. Compared to today’s surging demand and matching price, cobalt hasn’t been a particularly popular metal to mine historically. The Highline claims were mined between 1917 and 1921, producing 132 tons of copper at an average grade of 35% (from 477 tons of ore) — the highest grade in the district. In 1921 two lots of cobalt ore were sorted from the dump, being 2,190kg and 545kg which returned 6.35% and 12.45% respectively. From a geological perspective, the mineralisation at the Highline Project occurs as flattish tabular bodies that are either bedding parallel or cross at low angles where the bedding is dipping or follows steep dipping fault zones. 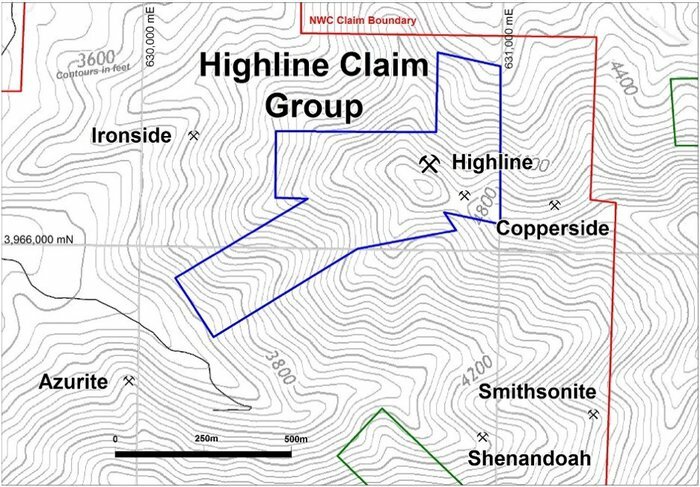 Highline Mine — Mullock on Hillside, and Highline Adit. Given the Highline mine’s previous mining and exploration was circa 100 years ago, DLC’s experienced project team — assembled to advance the Highline Cobalt-Copper project – believes that it represents a relatively low risk opportunity in an area of known mineralisation. Although just how low risk remains to be seen and investors should seek professio0nal financial advice if considering this stock for their portfolio. DLC’s geology team has determined that the target cobalt mineralisation is separate to the surrounding lead/zinc mineralisation in the district, and is closely associated with northeast near vertical structures and sheared bedding planes. The mineralisation is predominantly copper with cobalt as an accessory. Cobalt oxide (black mineral) from the project. Upon completion of the acquisition, DLC plan to get cracking immediately on a program that makes use of modern-day techniques and methods that this highly prospective area has never seen before. To support these cobalt ambitions, the small cap has an experienced team including geologist Greg Smith (BSc in Geology from Dalhousie University in Canada). Smith has 40 years’ experience as an exploration and mining geologist in North America, Africa, Australia and South East Asia. Former roles include Exploration Manager for Moto Goldmines on the Moto Gold Project, and Managing Director of Elemental Minerals (now Kore Potash). DLC couldn’t have chosen a better spot as a starting point in the world of cobalt exploration. There’s been plenty of historical mining in and around the Goodsprings area, as already touched on. NWC has its hands on the Goodsprings Copper-Cobalt Project, less than 1km from DLC’s Highline claims area. After initial acquisition, NWC has been staking extensive new ground and increasing their landholding in the district. Maybe the NWC early exploration results has given them the jump on their neighbours, but DLC is about to catch up. 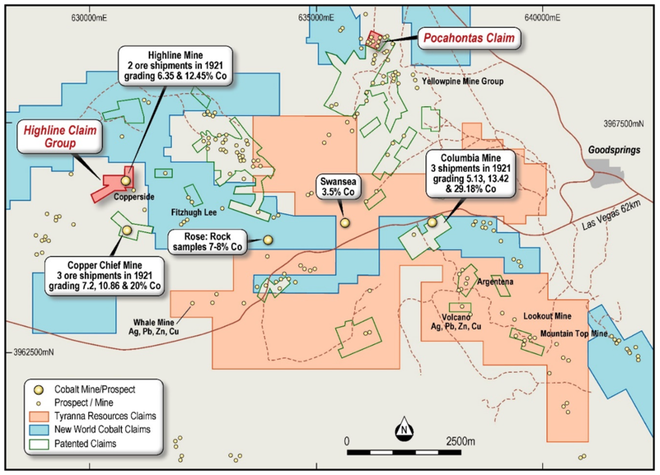 NWC’s project encompasses 100% interest in 488 Federal mining claims, covering approximately 9,500 acres, including several historic copper-cobalt deposits and a number of patented claims totalling 120 acres that includes the high-grade Columbia Copper-Cobalt Mine. You can see how close DLC will be and given the aggressive exploration going on in the area, as well as all the acquisition activity, we should see a quick flow of news coming from the DLC camp as it looks to immediately begin exploration in order to quickly catch up to the growing successes of its neighbours. It should also be noted that Tyranna Resources (ASX:TYX) is also a neighbour. Tyranna acquired Goodsprings Cobalt and Base Metals project (not to be confused with the similarly named NWC’s Goodsprings Copper-Cobalt Project) via its acquisition of private company US Cobalt. Again, you can see just how close Highline sits to these other prospects. 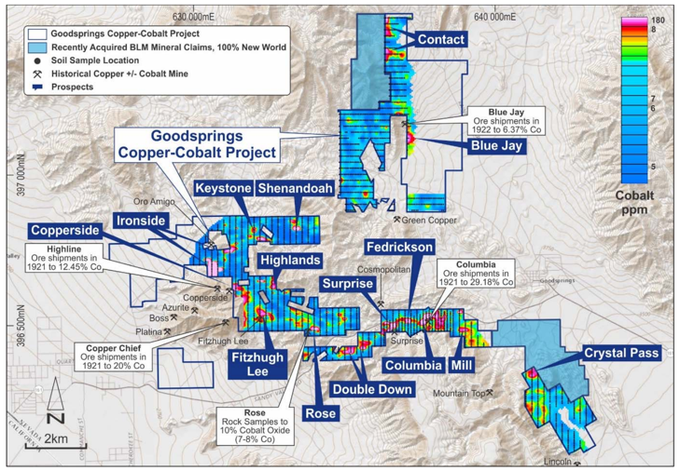 We are getting the picture here that some of the district’s highest-grade cobalt mines are within the Goodsprings region. With nearby explorers drilling and announcements set to filter through in the coming months, DLC should have extra help in bringing attention to its new project as it ultimately get drill-bits spinning as soon as possible. It is commencing an exploration program immediately meaning plenty of news flow to come. So with the release of today’s news, it could act as a shot in the arm for this micro-cap, potentially sending its share price northwards at a much faster pace than its currently tracking.